Advanced Metal Fabrication provides metal roofing services to the Great Lakes region. We are located in Maumee, Ohio just outside of Toledo and we have over 50 years of combined experience in the metal industry. AMF can fabricate and install many different profiles and systems in today’s market, including standing seam, exposed fastener, structural low slope metal roofing and Snap Loc. Long lasting durability – it’s not uncommon for metal roofing systems to last 50 years or more! Energy efficient throughout the year. Light-weight materials which help relieve stress on structures. Better for the environment than traditional asphalt shingles. Beautiful appearance with many color choices to match any tastes! Considered a “Green” and sustainable approach to roofing. 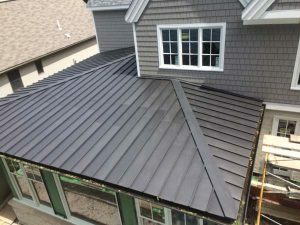 Metal roofing systems can be fabricated in numerous colors, patterns and styles. Regardless of the style of the building being installed on, AMF can show you all of the different design options that you can choose from. Whether you’re looking for simplicity or you want an intricate pattern, there’s little that can’t be achieved with a metal roofing system. For all of your metal roofing needs in the Toledo, Ohio area and the Great Lakes region, depend on Advanced Metal Fabrication! Call us today at 419-891-4030 to get started!